The Bills had finally made it to the Super Bowl, and we marked the occasion with a small, intimate gathering at our cinder-block townhouse in Brockport. Bill and I had traveled to Cleveland a year earlier and nearly gotten ourselves killed by taunting Browns fans until Ronnie Harmon saved us, but seen Buffalo gain redemption, and a berth in Super Bowl XXV, a week earlier in Orchard Park. Doug and John, fierce Miami partisans, had vowed to put aside their deeply ingrained animus toward the Bills for the evening. And Pete, like most Jets fans, had grown accustomed to living vicariously through the success of other teams. We had stocked up with all manner of saturated fats and high-fructose corn syrup delivery vehicles, along with more than enough of the world’s third most-popular beverage to ensure proper digestion. As a rookie sportswriter for the Batavia Daily News, I had published my first column predicting the exact score of a football game. This was before the day of internet archives, or internet anything, for that matter, so I’m going from memory here, but believe my expert prognostication was Buffalo 35, New York Giants 16. 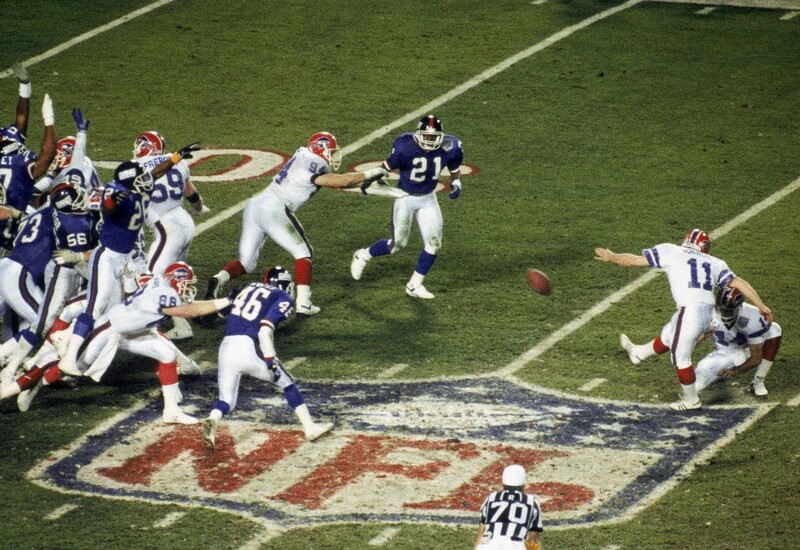 There was simply no way the Giants, with an offense revolving around career backup quarterback Jeff Hostetler, 33-year-old running back Ottis Anderson and a group of nondescript receivers, could possibly keep up with Jim Kelly, Thurman Thomas, Andre Reed and Buffalo’s revolutionary K-Gun attack. After all, the Bills had laid 44 points on Miami in the Divisional Round, then annihilated the Raiders 51-3 in a game so one-sided, the crowd spent most of the second half singing derogatory taunts directed at Los Angeles quarterback Jay Schroeder, most of which called his sexual proclivities into question. Some combination of our Super Bowl-watching party had attended each of those two glorious victories, so we had no doubt that even the NFL’s stingiest defense could stop, or even significantly slow, Buffalo’s no-huddle blitzkrieg. The Giants, meanwhile, hadn’t even scored a touchdown while sneaking past San Francisco in the NFC Championship Game. A bunch of field goals weren’t going to cut it, and the Bills were going to roll. Didn’t quite work out that way. New York ate as much clock as possible every time it had the ball, and stalled the over-eager Bills often enough to keep it close throughout. We relaxed a little when Thurman Thomas broke a 31-yard touchdown run on the first play of the fourth quarter to put the Bills ahead 19-17. Here we go. The defense would make a stop, the offense would ride the clearly shifted momentum to another touchdown and the Giants wouldn’t have time to dink their way past a two-score deficit. Instead, New York leisurely spent half the fourth quarter moving to Matt Bahr’s go-ahead field goal. It wasn’t until an exchange of punts left the Bills at their own 10-yard line with 2:16 remaining, that anybody admitted to any doubts about a Buffalo triumph. Sure enough, the Bills moved in torturous fashion down the field, with Thomas ripping off a couple long runs on draw plays and Kelly picking up more yards running (18) than passing (10). Somehow, Buffalo got to the Giants’ 30-yard line with eight seconds left. You know what happened then. Curses flew around the living room. Bill plunged, face-first, to the floor as the Giants started jumping around. Doug silently stood up and walked to the kitchen, where what had been planned as a celebratory batch of victory wings sat poised above an ancient deep fryer. The fryer, as it turned out, contained much more bubbling grease than was necessary, or safe, to cook the frozen wings. The boiling oil started spraying from the fryer, coating the counter and splattering the wall behind it. Bill — almost always the most responsible member of our group — somehow shook off the agony of Wide Right, pulled himself off the floor, to get the fryer’s plug out of the wall before our heavily carpeted townhouse, as well as the adjacent units, ignited. The near-inferno had offered us a much-needed distraction, as well as perspective. The Bills had lost, but in the most exciting Super Bowl up until that time, and only the second to be decided on the game’s final play. They would be back. And next time, there was absolutely no doubt they would get it right. Besides, none of us would require a skin graft. YouTube offers a variety of options for facilitating your memories of January 27, 1991. Thanks to surprisingly lax copyright enforcement, you can luxuriate in every agonizing moment, starting with the pregame show. If you don’t have four hours to spare, and want a little international flavor, you can enjoy the highlights narrated in Japanese. Or, if you’re really in a hurry, just cut right to the chase.